Whistle Stop Amusement Park was a fun park located in Frankston in the early 1960's and operated for about 10 years. Whistle Stop Amusement Park featured rides (see below), picnic grounds, pedal boats on large lake with island. Go karts and merry go round and a chairlift. It was established by an ex service station owner Jack Griffiths and all rides were created or renovated in-house. 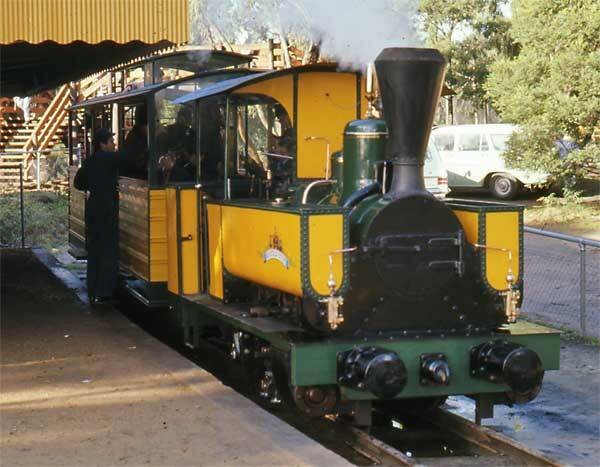 The first item built was a narrow gauge railway using a renovated engine from the West Melbourne gasworks. The steam railway ran on 3/4 miles of track around a lake and scenic bushland. After Whistlestop the engine went to Puffing Billy Railway, and the track and other stock went to Caribbean Gardens in Scoresby. There is little documentation of the parks existence, as it was sold for housing as the suburb expanded and land rates became prohibitively expensive. There is a small park called Whistle Stop Reserve in Skye Rd which covers some of Whistle Stop's area. The rest is now a housing estate. Jack Griffiths was a man with big ideas. And his idea to bring a bit of fun to Frankston proved a big hit. Sadly, though, it was just for a short time. In 1950 the Frankston property developer and former motor mechanic bought 38ha of bush in Skye Rd and in 1966 Whistle Stop Amusement Park opened for business. Mr Griffiths' son, Trevor, said the water authority at the time wanted the proprietor to pay water costs equivalent to the 400 house blocks estimated the park's land covered. It was a cost the elder Mr Griffiths was told would continue to rise, so he was forced to close the complex on May 26, 1974. Chair Lift (moved to Caribbean Gardens*).